St John's Wood, Lunnon, Ingland, U.K.
Mark Daniel Ronson (born 4 September 1975) is a Breetish muisicker, DJ, sangwriter, an record producer. 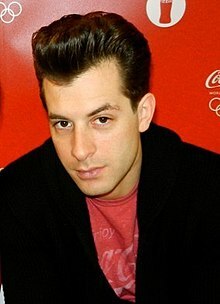 ↑ "Mark Ronson | Music Biography, Credits and Discography". AllMusic. 4 September 1975. Retrieved 16 July 2014. This page wis last eeditit on 17 Dizember 2018, at 07:50.